Diamagnetic satellite ready for launch 2015. WHO’S INVOLVED: This project began as an entry for the Canadian Satellite Design Challenge (CSDC). CSDC strives to inspire students to pursue science and engineering educations and careers, and prepare tomorrow’s leaders with the interdisciplinary teamwork skills which are necessary for success. ECOSat was established at the University of Victoria (Uvic) to create a team of ambitious students to accept this challenge. AGO was approached for interesting payload experiment ideas and seized the opportunity to put forth the study of diamagnetics in outer space. The payload was then partitioned into multiple experiments, two of which have been taken on by a team of Mechatronics students from Uvic as part of an ENGR 466 course. Since the original proposal, there has been an increasing amount of interest from a wide range of disciplines. From physicists to retired aerospace designers and professional engineers, there’s been tremendous support. OBJECTIVE: The objective of this project is to obtain basic diamagnetic experimental data that will provide insight on how diamagnetics interact with the Earth’s magnetic field in a micro-gravity environment. Due to the short time frame available for experiment development, the payload systems have been kept simplistic to ensure they function properly. However, these experiments are just the beginning of a very promising area of research. There’s a strong possibility of engineering new materials that can greatly enhance the diamagnetic effect. The purpose of these experiments is to stimulate this research area and create awareness. There’s great potential for this research to lead to a new diamagnetic drive system for space craft’s. Depending on the results, there may also be other applications. BACKGROUND: The project traces back to 1972 with the discovery of gold and fluorite in the Deloro Ontario area, both materials are naturally occurring diamagnetics. The basic principal of a diamagnetic material is that if exposed to an external magnetic field, the material will generate an opposing magnetic field that causes a repelling force. Therefore, the diamagnetic material will repel regardless if it’s the N or S side of a magnet that is in close proximity. Two such materials that possess this property are Bismuth and pyrolytic graphite. For this specific project, minimizing weight is critical, so pyrolytic graphite is the optimal choice. Furthermore, pyrolytic graphite has a larger molar susceptibility than Bismuth (about 60% greater). To become more familiar with pyrolytic graphite, there are many videos posted on YouTube showcasing its diamagnetic properties. A common demonstration is to levitate a small piece above magnets. The force of diamagnetism eventually might be used for inter-stellar travel; it would be much like sailing in space using interstellar magnetic field “winds” to repel the diamagnetic sail. This project is very basic and may involve locomotion. We are simply measuring diamagnetic force interactions in the micro-gravity environment of an orbiting satellite in a variable magnetic field. There are currently 4 different experiments slated for the payload system. These are listed below with brief descriptions. Satellite orbit will be in the 800 km range with an expected lifetime of 1 to 5 years. Experiment 1: An evaluation of the use of photon energy to modulate the magnetic moment of a fluorescing diamagnetic crystal e.g. Blue John fluorite. Measurements will be made to determine the feasibility of further developing a photon controlled diamagnetic accelerator for later experiments. This could lead to the development of a controllable magnetic gradient system. Oct 22 2013, this experiment will be held for future development or if time permitts. A variety of Blue John samples have been donated to the project by Richard Haw, a geologist in England. These samples will be tested and the best one selected for the magnetic susceptibility fluoresence experiment with the 405 nm laser. Experiment 2: An evaluation of the effects of background radiation and angular coupling of variable magnetic fields in micro gravity on fixed sheets of pyrolytic graphite. This will use dual Geiger counters and a sensitive IMU system. Ian Soutar is responsible for aspects of this experiment. He will be using 2 of Yaguchi Electric Co. Ltd. og Japan Pocket Geiger units. Experiment 3: Satellite motion control systems. As a result of new mag-lev research of diamagnetic materials from Japan, we will be removing the rotary pyrolytic experiment and including 4 high powered lasers integrated in such a way as to influence pitch and roll of the satellite in a controlled fashion. This will complement the present Magnetic torquer system that presently fulfils this function. Since the magnetic torque system works best in the equatorial area of the orbit and is not functional in the strong polar regions and the diamagnetic system is just the opposite they should prove complimentary. An integrated control program will have to be developed along with estimates of the forces developed by the diamagnetic system. Ed Haslem has developed the Mini Nogin control computer along with writing the controll programs and intergration of all experiments on the satellite. June 1 2014 a short essay on the theory of photon energy to motion of a diamagnetic material, as posted on the University of Marylands’ Coursera Quantum Physics discussion form. Experiment 4: Incorporation of a cmos camera to capture timely photos of ice conditions in the Polar Regions to monitor for possible open water conditions with melting of sea ice. Richard Howes an Electronics student from Camosun College has taken on this experiment and will be working with Ian and Ed interfacing the unit with the radiation experiment as well. A look inside at the experiments. 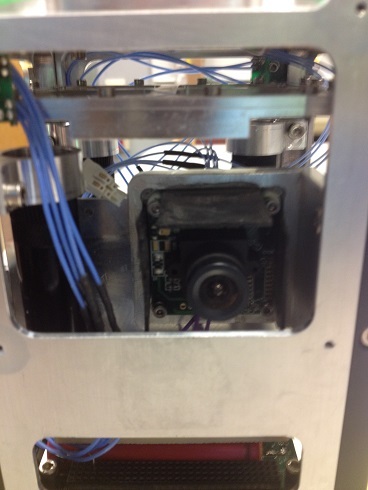 The three 980 nm 300 mw lasers can be seen along with the cmos camera shielded with PG against gama rays. The geiger counter is located behind the camera out of site. 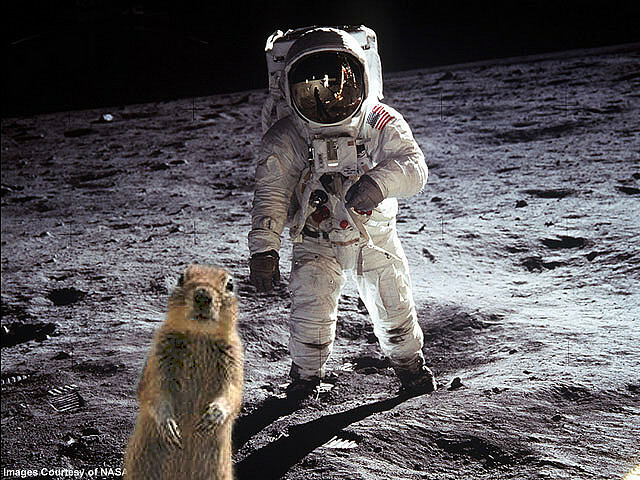 This project has been dubbed “Squirrel?” in honour of the dog from the movie Up, because of the effect it has had on the principle of AGO and Jim Harrington whom is the principal investigator and theorist behind the diamagnetic experiments for the satellite. 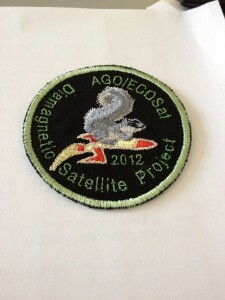 Update July 27, 2012: The flight patch for the project has been completed, and are available for a cost of $30 CDN. A 2014 patch will be availble later next year. Update August 03, 2012: Two provisional patents have been set up based on a couple of the experiments that are being conducted on the space craft. One is being used to test the viability of Pyrolytic graphite as a new type of radiation shielding. The second provisional patent is for the diamagnetic force modulator using fluorescence. Update: July 05, 2013: A new video can be found on YouTube demonstrating motion control of a diamagnetic material via optical heating changing the magnetic moment or susceptibility. This is one of two proposed methods, one for pitch and roll and the other for linear drive that is based on an inter active fluorescence affect. A link to the latest video of the experiment, 405 & 980 nm photo heating control of diamagnetic pyrolytic graphite can be found by fallowing this link. Update: November 18, 2013: an the ECOSat team will be travelling to the University of Tokyo to present our idea at the UNISEC Global Meeting. Ideas, from all over the world, were submitted in August and our project was chosen along with 4 others to continue in the competition. Congratulations to the Student group on this achievement. Update: May 29th, 2014, They won the satellite challenge! Congratulations to the Student group on this great achievement. They have opened the door on a whole new area of physics, with so much yet to be discovered. 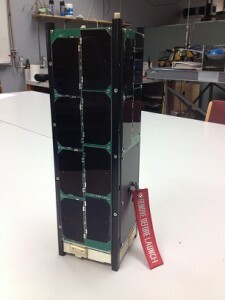 University of Victoria students’ tiny satellite aims for the stars. Update: June 11, 2015: The Canadian Satellite Design Challenge Management Society (CSDCMS) recently presented a ceremonial cheque to the University of Victoria’s Satellite Design Club, ECOSat. The approximately $11,500 cheque was a prize for winning the second bi-annual Canadian Satellite Design Challenge (CSDC). Congratulations! The end goal for this project is the development of a quantum drive system for an unmanned inter-stellar space craft capable of travel at near light speed to the constellation Alpha Centauri with a flight time of 20 to 30 years one way. This will require the development of super diamagnetic materials similar to neodymium magnets combined within a fluorescing matrix as the basis of the controllable diamagnetic moment creating a traveling anti-magnetic bubble that interacts with regional magnetic fields. If the magnetic fields of a Blue Dwarf star can be located then field intensities may thousands of times that of our star would be realized.